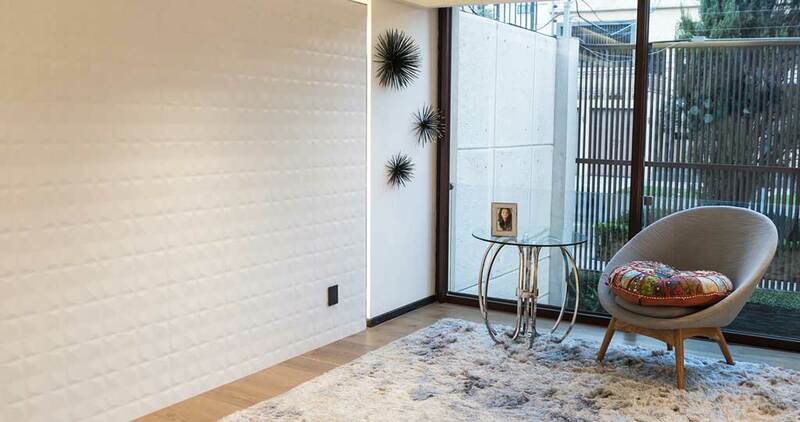 A home must convey the personality of those who live in it, so the interior designer overseeing the design of this residential home in Mexico has opted for the combination of PORCELANOSA Grupo materials to achieve just that. 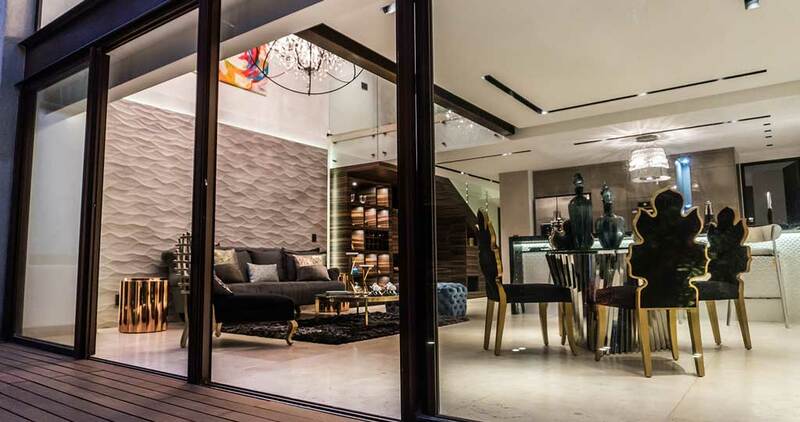 In this sense, dynamism and contrast are the main attractions of this project, in which the main objective is combining what is classic with cutting-edge design, which manages to create a welcoming and warm atmosphere without losing a single bit of sophistication or style. 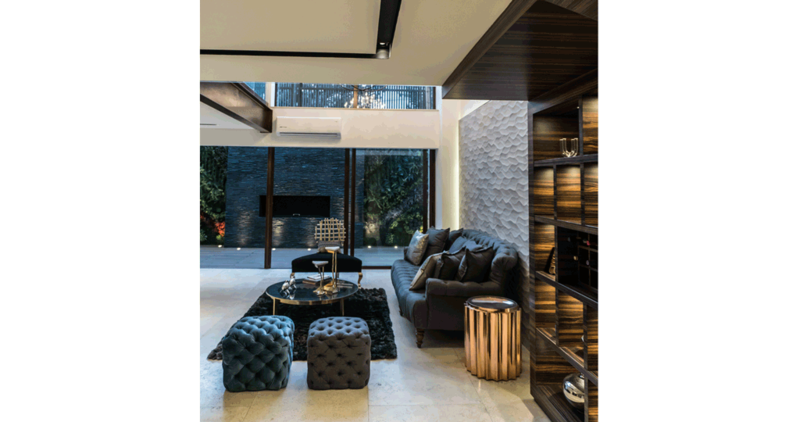 Thus, the luxury and magnificence of the furniture blend in perfectly with the soft and natural lines of the materials in this single-family home in Mexico, which places special focus on the textures and the tactility of the surfaces. The main feature of this project is the mixture of materials, which bank on a combination of different floor tiles and wall tiles without any visible union in the same room, which bring dynamism and liveliness to the atmosphere. To do this, materials of a different nature have been chosen from the firm, Venis, whose combination achieves a very powerful visual effect. 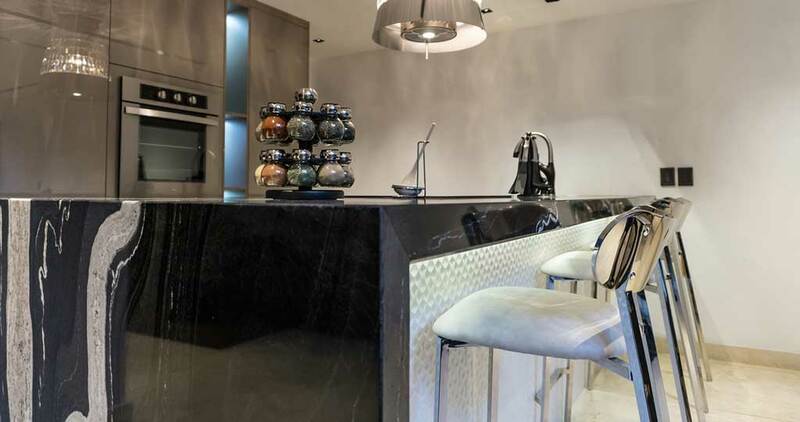 First and foremost, the chosen materials have been installed in the main room of the house, a living room connected to a kitchen with a large island in the centre. It is a large room in which the interior designer has opted for creating different areas that are differentiated by shades and patterns. Firstly, the main wall of the living room has been coated with the Ona Natural decor in a 33.3cmx100cm format in order to provide relief and generate contrast with the pieces of furniture, which respond to a more classic style in a large size in black and gold. 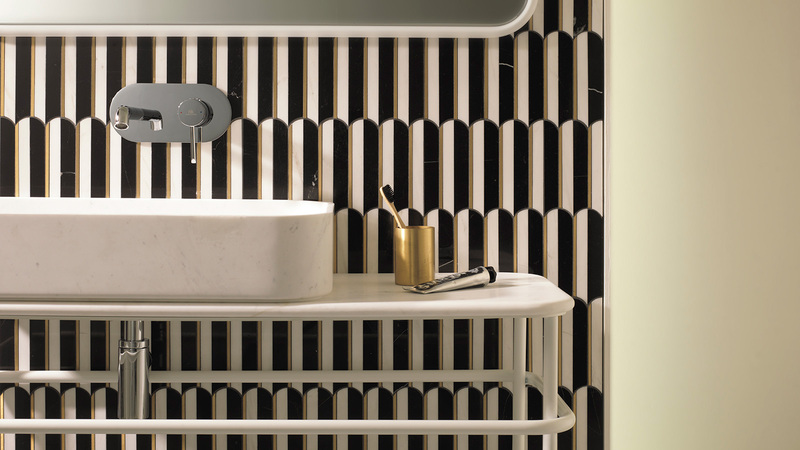 Ona is part of the Madagascar collection by Venis and it is available in 4 different shades, ranging from the purest white to the most intense brown, through beige and natural. On this occasion, the brown tonality has been used in contrast to the prevailing clear tone in the rest of the room. Continuing with this commitment to the clash between colours and textures, in the opposite part of the atmosphere, another space for relaxation has been created to enhance the luminosity. For this, the Diamond White matt finish wall tile from the same firm has been chosen, also in a 33.3cmx100cm format, which achieves a sense of spaciousness while taking advantage of the outdoor light. As well as that, in the intermediate area of the room, more neutral colours have been used to harmonise the contrast of colours in the other two atmospheres, but with the prevailing textures being kept. Thus, the Park Beige wall tile, from the NewPort collection by Venis, has been chosen in the same format as the previous pieces (33.3cmx100cm), to transmit calmness and mobility through the small waves that are created with the composition of these pieces. Regarding the living room floor, Oxford Cognac has been used, a collection of ceramic parquet from Porcelanosa's Par-Ker series, which conveys the purest naturalness and authenticity of wood to the resistant and versatile floor tile. Regarding the kitchen area, the visual load has been focused on the central island in order to enhance the colour contrast. To do this, the Artis White Matt from the Venis collection has been chosen, which brings luminosity to the atmosphere in contrast with the predominant dark shade in the rest of the room. Therefore, it has been possible to combine different atmospheres in the same space, mixing different colours from dark to light, passing through intermediate shades and taking advantage of the materiality of the pieces to create optical effects of great beauty. A project that is both cutting-edge and timeless, and which has managed to make the most of the aesthetic possibilities of the home.